The Helpful Home: Scoop colandar...Multi-purpose kitchen gadget! A great find! Scoop colandar...Multi-purpose kitchen gadget! A great find! Update: This is a scoop colander by Joseph Joseph is by far, THE BEST kitchen gadget I got in a very long time! It's made of silicone, so it is durable, won't burn, and cleans easily. I use it to scoop and drain pasta, fry gyoza (pot stickers), fry chicken, use as a colander or strainer...right from the pot or pan...or to grab a lot of food at one time. It comes in three colors--black, green, and red. It's dishwasher safe too! If you use a Macy's coupon, it costs around $8-9. 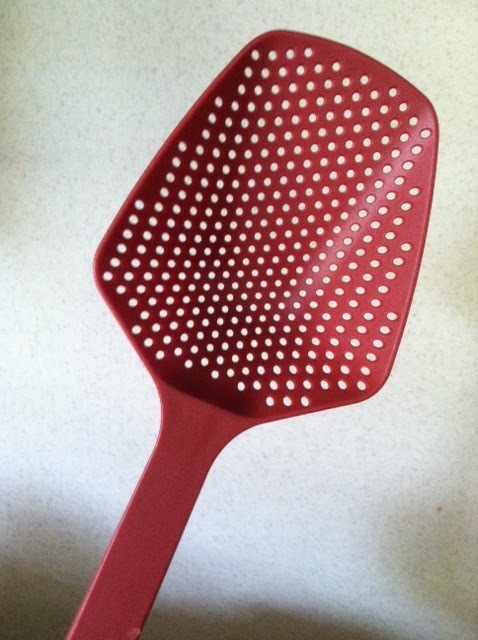 I use it for so many purposes, I'm thinking about throwing away a few other kitchen gadgets and just use this! Get it...you won't regret it!